Temple University football fans are having a hard time coping with the sudden departure of head coach Matt Rhule, who accepted a job with Baylor University days after leading the team to an AAC Championship. It's a painful turn of events to process, especially for those who believe Rhule sold the Owls out after seemingly committing to them in strong terms this time last year. But change is a part of life, and the one thing distressed Temple fans should not do today (or ever) is bully this other Matt Rhule on Twitter. He's a high school kid, people. Please look who you're tweeting at, for the love of eyes. At one point, young Matt Rhule decided he might as well embrace the tremendous responsiblity placed upon his shoulders. And then he didn't really want it. 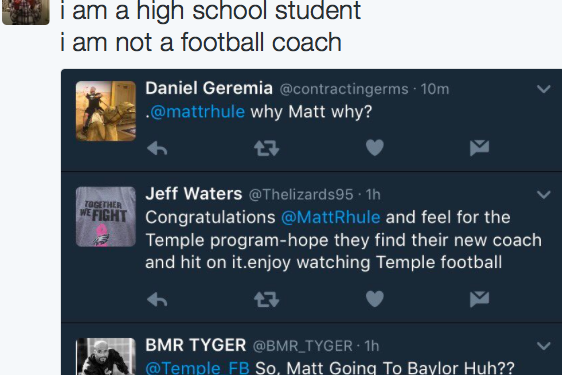 The best part about high school Matt Rhule is this mind-blowing Vine he retweeted yesterday.